Lead up to October 5 - Temples all over Laos begin preparation for lights and candles. You can see them building their wooden boat that will be used for the Boun Loy Heua Fai. October 5 - Actual day of End of Buddhist Lent Awk Pansa. Lay followers meet at the temple in the evening, sit down in prayer with the monks, do a walk around the temple three times with a candle (vien tien), then leave lit candles all around the temple. Awk Pansa religious ceremonies and a picture of the festival market. October 5-6 - Boat Racing Festival Boun Suang Heua also begins at this time and is done in multiple cities across the country. 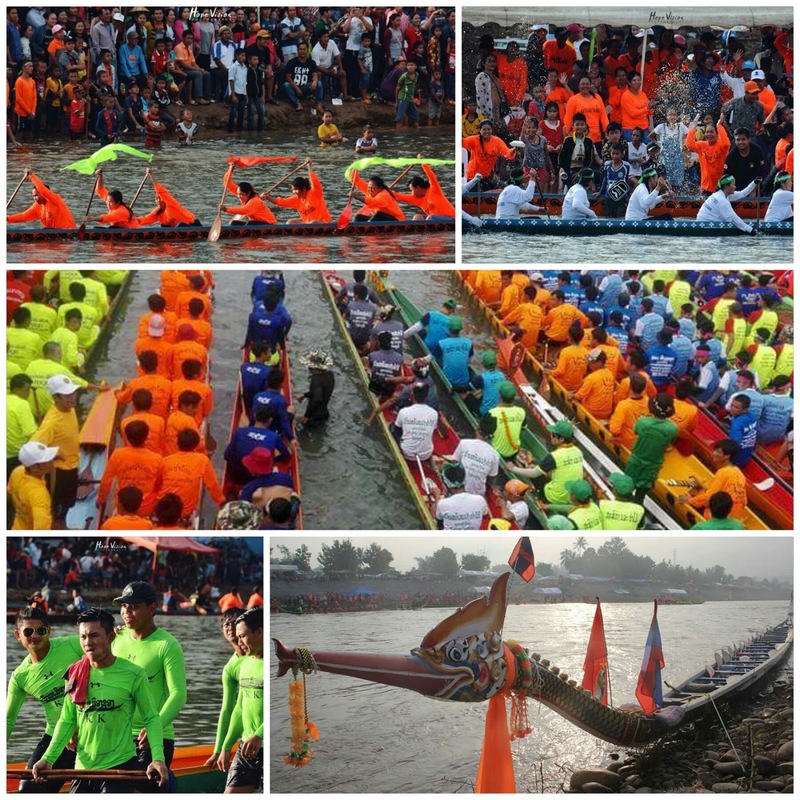 The largest boat race is in Vientiane with lots of participating teams and big prizes to be won. Typically in Vientiane it's held on the Mekong River near Kem Kong (also known as Fa Ngum road). Along this same location and near Chao Anouvong Park, there is an open-air street fair with lots of vendors selling wares and food. Photos taken from Vientiane, Luangprabang and Vang Vieng. October 6 - Festival of Light Boats Boun Loy Heua Fai - Involves lighting of the large boat with candles at the temple (lai heua fai). Then the large boat is lead to the river in a parade/procession by both monks and lay followers where it is released on to the river (loy gatong). 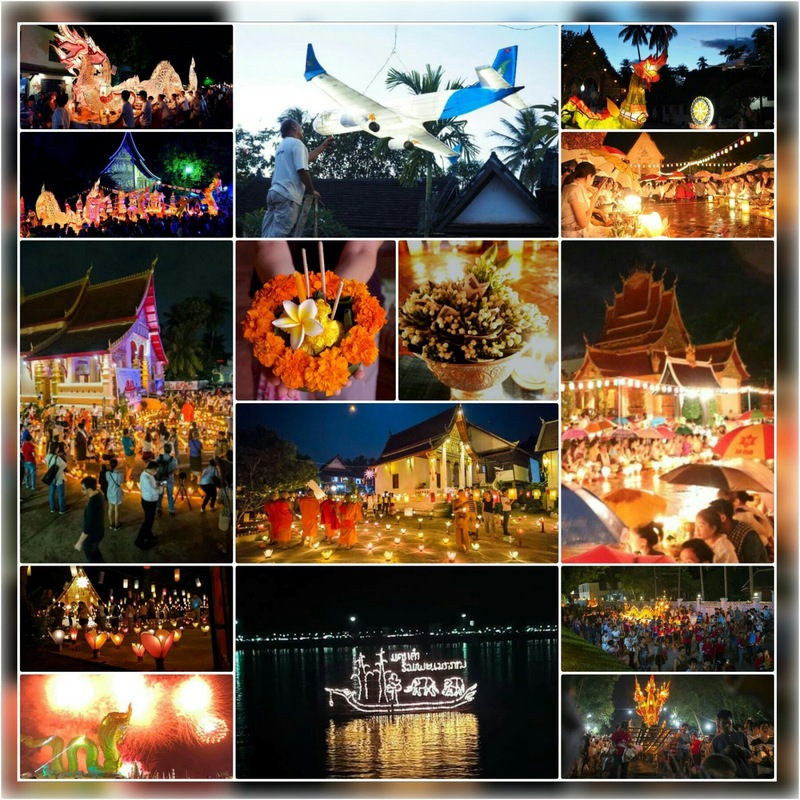 It also during this time, that lay followers release their own little floating boats made of banana leaves and flowers with a candle on it onto the river - this portion of the event is called loy heua fai for which the festival gets its name from. People often make wishes and a prayer before they release their boat. Many companies even sponsor their own boats or lanterns to help promote their businesses. At all temples across the country candles and lanterns are lit. 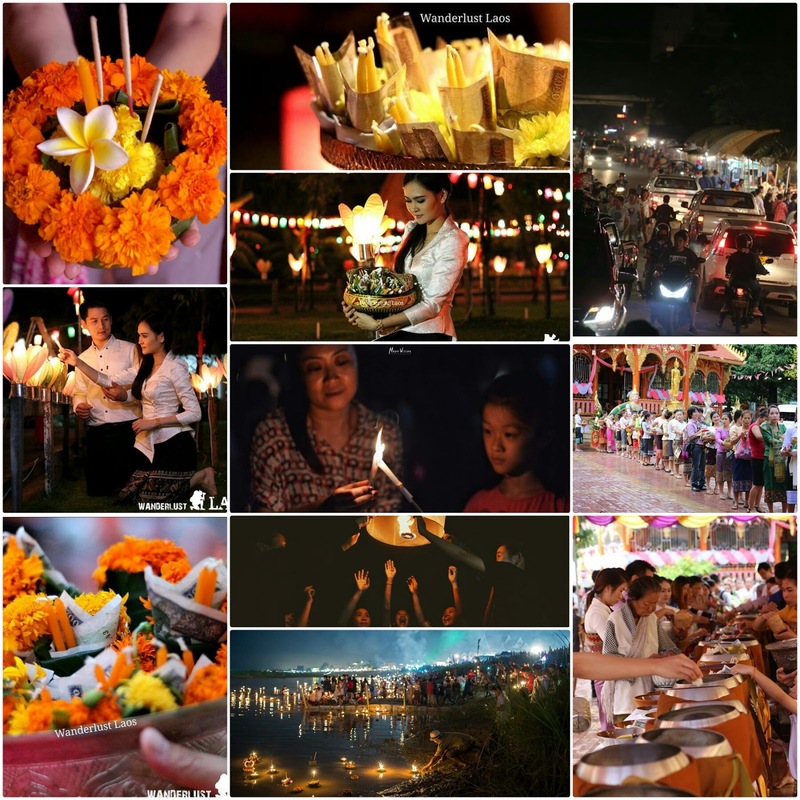 However, in Luangprabang this festival has become more elaborate with a full parade, extensive paper lanterns in varying shapes, and a variety of light decorations at the temples. October 6 - Naga Fire Rocket Bungfai Paya Nak - Not to be confused with the Rocket Festival that takes place in May. This is the last event of the night of Awk Pansa. Specifically, you can see it at 2 locations. One, where Nam Ngum and the Mekong River meet in Thaprabath District in Bolikhamxay Province and secondly, at Pak Ngum District 60 km east of Vientiane. Some background: The naga is called nak in Lao. The event is celebrated with fireworks. However, the main attraction are the mysterious fireballs that come shooting out of the water that are said to come from the nak. Videos and pictures of this on the internet show this as well. All the photos used in the collages shown here were borrowed from Facebook public posts of several FB accounts including Alan Liu, WatXiengThongRATSAVORAVIHANH, CNNLaos, kammuan daen yam, Latdavanh Sengchanh, Bee Valentine, Vientiane Times, and Wanderlust Laos. All photo credits belong to those photographers.